Our completely renovated large one bedroom, 1 bath condominium is in a resort complex on the southern part of New Smyrna Beach. There is no driving on our beach! The grounds are tropically landscaped and include a beautiful oceanfront heated pool (winter months), large baby pool, ocean front gas grill and clubhouse, lighted tennis court, shuffleboard, and large patio gazebo. Step from the pool onto the white sandy beach of the Atlantic Ocean to fish, swim, surf, play volleyball, bicycle, or sail. We are on the third floor with an excellent view of the ocean. Our condominium is 900 square feet, has been completely renovated, and is stocked with everything to make your vacation comfortable. We have a washer and dryer in our condo. The master bedroom has a king-size bed and large vanity area. Relax in the living room on our very comfortable queen-size sofa and large, comfortable chairs. Both our master and living room have large flat screen TVs with plenty of cable channels. Our dining table seats 7. The kitchen has all the comforts of home and overlooks the dining and living area. We also have high speed wireless internet available and free long distance phone service. Work from the beach, pool or porch with our secured WI-FI connection or plug into our cable modem for high speed internet in the condo. We are only an hour away from Orlando, home of Disney World, Sea World, and Universal, and only a half hour to Daytona and Kennedy Space Center. New Smyrna Beach was voted 'Best Beach in Florida' by the readers of FLORIDA MONTHLY MAGAZINE and has numerous art galleries, live theater, shopping, and dining. Visit historic Flagler Avenue with its quaint shop, pubs, and restaurants. 1.25 Large vanity area in master separate from bathroom. The bath has a shower only - no tub. 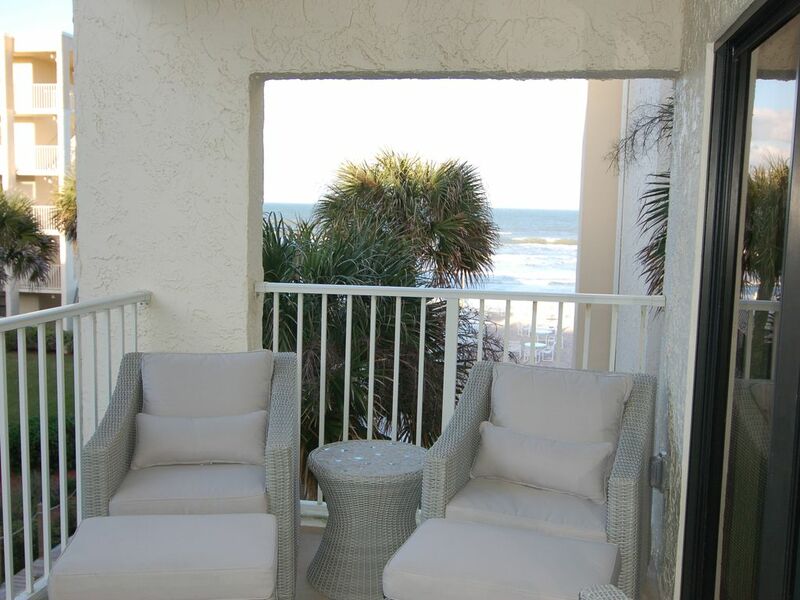 Our large balcony has a wonderful beach and ocean view with four very comfortable new chairs with ottomans. Listen to the sound of the waves as you relax from the comfort of your own porch. Our complex is beachfront and is on the desirable no driving section of New Smyrna Beach. We have a beautiful heated swimming pool overlooking the ocean and a baby pool too. Our condo has a wonderful ocean view of the no drive section on the south end of New Smyrna Beach. Our complex is oceanfront. We also have an ocean front club house for your use and a gas and charcoal grill. Castle Reef is tropically landscaped. We also have tennis courts for you to enjoy. There are comfortable sheets for the kingsize bed and queen size air mattress. We have a washer and dryer in our condo. Light loads only please. Full size washer and dryers are on the same floor as the condo. We have a washer and dryer in our condo. Plenty of parking. Park anywhere except during the week of July 4th and then designated parking for one vehicle is permitted. All towels including beach towels are provided. The refrigerator has an ice maker and water dispenser. Our kitchen has everything you need including a blender, mixer, coffee pot, Keurig coffee pot, toaster, microwave, dishwasher, disposal, and refrigerator with ice maker. We have a child's booster seat. (2) We have extended cable and high speed inernet - wifi. Our balcony has a spectacular view of the ocean! Our swimming pool in ocean front and heated! There is a gas grill and clubhouse near the pool and also a cabana and baby pool. You can reserve the clubhouse for the day for an event too. We really enjoyed our stay. Lovely well-appointed condo with all the amenities including beach chairs, towels, and umbrella. Very convenient access to the gorgeous New Smyrna beach. Across the street are excellent restaurants for breakfast, lunch and dinner. We had a relaxing vacation, just what we were looking for. From walking in the door to this awesome condo until walking out - we loved our stay!!!! Could not have more pleased with our experience!!! Would certainly do it again! We really enjoyed our stay at Sally's place. There were ample towels, cookware and the bed was super comfy. The view of the ocean was better than expected and the condo was tastefully decorated. The complex was quiet and well kept. We had a really nice time. We had to purchase paper towels and dish soap, but that was no biggie. The only thing that was a surprise, and I have never encountered this before, was the $1700 security deposit charge ahead of time. I thought it would be $200 and, in the event of a mishap, I would then be charged a damage fee. Everyone I've spoken to about it had never heard of that. I recently stayed in Beaver Creek in a two million dollar condo and wasn't charged a security deposit. Just wish that was clear upon booking. Nonetheless, it was a beautiful condo and a very pleasant experience. Great accommodation and location. We completely enjoyed our stay! Sally May’s condo is a wonderful, updated, beautifully decorated place. It has everything a person needs needs for a great stay at the beach. The ocean view from the balcony is enjoyable and the beach and pool are amazing. Definitely at great place. Clean, comfortable and tastefully appointed. We very much enjoyed our stay.